Today, the preliminary 2014 schedule was released. It's preliminary schedule, so things could change, but let's take a look at what we have for now. The Rays open at home, for fifth straight year, against the Blue Jays on March 31st. It will be a 3-game set. The first road trip in 2014 will be a 3 city tour of first Kansas City, then Cincinnati, then Baltimore from April 7th through the 16th before returning home to face the Yankees in a 4-game set from April 17th through the 20th. West coast trips are May 12th through the 18th (a two-city stop in Seattle and Anaheim) and August 4th through 6th when the Rays visit Oakland. The Jackie Robinson Day game is on the road in Baltimore on April 15th. The Memorial Day game will be on the road north of the border in Toronto on May 26th. The Fourth of July game will be on the road in Detroit. The Labor Day game will be Home against the Red Sox on September 1st. And finally, the Patriots Day game will be on September 11th on the road in the Bronx facing the Yankees. You know there's gonna be some sort of ceremony at that game. There seems to be fewer NL opponents in 2014 compared to 2013. never the less the Rays will be facing some interesting NL opponents in 2014. First time the Rays see the NL will be April 11th through the 13th when the Rays visit The Great American Ballpark to face the Cincinnati Reds. Round 2 of NL opponents will be the annual Citrus Series. A split 4 game set against the Marlins. 2 in Miami on June 2nd & 3rd and 2 in St. Pete on June 4th & 5th. Next up is a 2 game set in St. Louis against the Cardinals June 10th & 11th at the Trop. Rays will later head to St. Louis on July 22nd & 23rd to face the Red Birds on their turf. Rays will face the Pittsburgh Pirates on June 23rd through the 25th at the Trop. Hopefully we show them there's only room for one swashbuckling team in Tampa Bay. Go Bucs! Rays will then have a visit from the Milwaukee Brewers from July 28th through the 30th. The Rays final NL opponent of 2014 will be the Chicago Cubs who the Rays will travel to Wrigley Field to meet from August 8th through the 10th. Can't wait to see our boys in blue play in the friendly confines. The Rays will start the proverbial second half of the season after the All-Star Break with a 3-game set in the Twin Cities from July 18th to the 20th. Which by the way is where the All-Star Game is in 2014 which means no traveling for Rays who are in the ASG. We see Boston the first time on April 29th and the last time on September 25th. We see the Yankees the first time on April 17th and the last time on September 17th. Rays close out the season at home on September 21st against the White Sox. 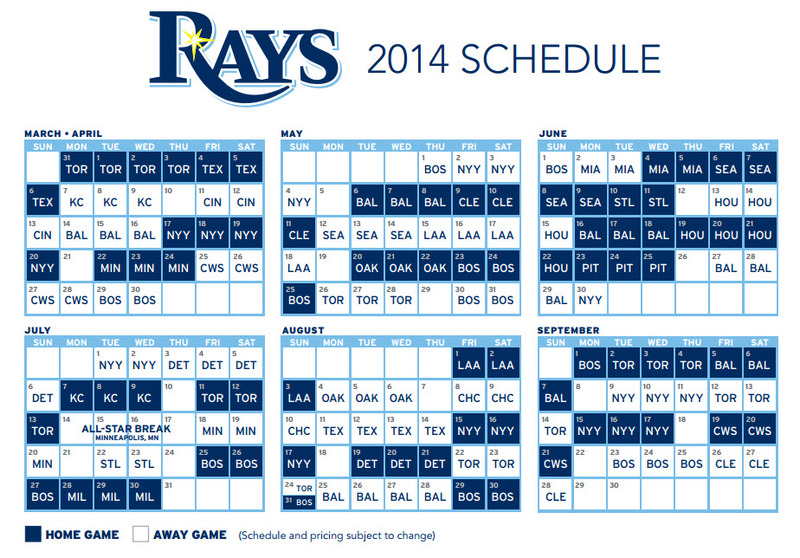 The 2014 season will end for the Rays on the road in Cleveland on September 28th.